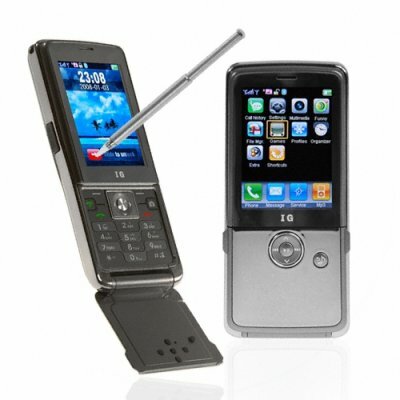 Successfully Added Elegant Flip Cell Phone - Compact 2.4 Inch Touchscreen to your Shopping Cart. Touchscreen GSM/GPRS multimedia flip style mobile phone with Dual SIM (dual active / dual standby), FM radio, plus Bluetooth as its primary features. Unlike some multimedia phones, this one is not locked into any particular network carrier, so feel free to use this unlocked cellphone with whatever carrier you prefer. With its native dual band GSM capability, this beauty can used in a lot of places in the world. Add to that the provided dual SIM slots allowing you to have two phone numbers in the same phone, and its like you can have two full featured cell phones packed into one! Contained within the user friendly touchscreen interface of the CVSA-439 are such features as MP3/MP4 player, digital camera and video recorder, image viewer, sound recorder, FM radio, and Ebook reader. With convenient controls on the outer shell, this most common media functions can be accessed without having to mess around with the keyboard. This phone makes a great gift for without busting the bank or overwhelming the novice user. From your source for direct from China electronics, Chinavasion.